Veloce 140', the new jewel in the crown of the Benetti Class Fast Displacement range, is a yacht with a great personality, deriving both from the technological innovations of the hull and propulsion systems, and from the distinctive design and furnishings. The most distinguishing feature is the new D2P hull designed by Pierluigi Ausonio Naval Architecture Studio and the Azimut|Benetti Research and Development Center. The most obvious advantages consist of the energy-saving, 12-knot cruising speed and the ability to travel at high speeds (over 20 knots) in total comfort. 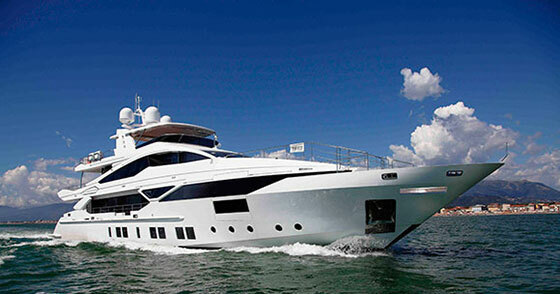 Veloce 140' - a semi-custom yacht with a D2P (Displacement to Planing) hull - is an innovative project that excites both Benetti enthusiasts, eager for greater speed, and those who are approaching the Tuscan shipbuilder for the first time, in the knowledge of being able to rely on high-performing yachts with comfortable displacement speeds. For more technical information, please view the attached press releases on the Fast Displacement line. Veloce 140'.The hull, first built for a yacht owner and a trusty Azimut|Benetti customer, is characterized by highly customized interiors, starting with the layout, which may be designed according to the customers' requirements. The Exterior Styling & Concept was developed by Stefano Righini, while the interior design is the work of the British RWD-Redman Whiteley Dixon, in collaboration with the owner's designer. The interior and exterior decor was entrusted to the international architect Joao Armentano. The woods used mainly include light gray TAY and slate gray TABU for the flooring. The decorative elements are in a silver lacquer finish and the ceilings in alcantara and a white lacquer finish. All stainless steel features come with a satin finish. The interior furnishings are by Minotti, the lamps by Flos and the taps and fittings by Gessi. As regards the technological heart of 140', it is worth noting the use of the largest engine ever mounted at the Viareggio Benetti shipyard: two MTU 12V 4000 M93L 3500 mhp engines. It is also equipped with a system of CMC Marine electrical fin stabilizers.